Indulge in your very own slice of French regency. There’s nothing pared-down about this look – the sumptuous mix of gilt-edged furniture with velvet textiles and metallic accessories will give you the feeling of absolute luxury. Soft, sensual fabrics feel luxurious but relaxing too. Think satin or velvet cushions and a snuggly thow – and they needn’t be expensive. We love the Raine & Humble Duck Weave Throw in Cloud Blue, pictured. It’s perfect for curling up under this winter. 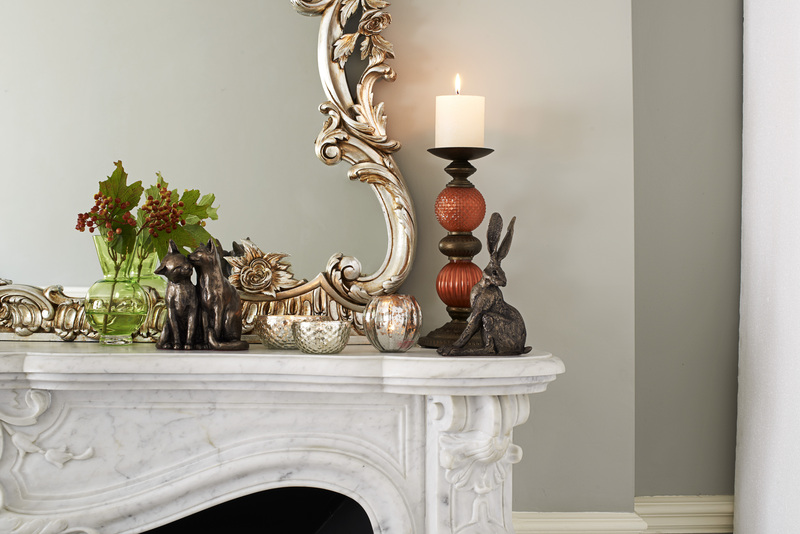 Twinkling candles and subtle gilt finishes create a really pretty look – and you only need a few touches. Add a few Nkuku tea light holders (they’re Fairtrade and eco-friendly) and some statement picture frames. This Thomas Kent Arabic Wall Clock in cream and gold is an elegant way to bring in soft metallic accents. Choose natural colours in a soft, creamy tone. From our Dulux collection, I’d go for Crushed Aloe, Almond White and Jurassic Stone (you can get tester pots too to try them out). You can find more ideas for how to get the Overtly Opulent look in our Inspire catalogue, and find all the products featured here. This entry was posted in Talking Ocado and tagged colour scheme, cushions, design, Dulux, gilt, home decor, home design, homeware, inspire, interior design, Nkuku, Ocado, Ocado deliveries, Ocado groceries, ocado.com, opulence, paint, Raine & Humble, shopping, Shopping at Ocado, soft furnishings, texture, Thomas Kent, throws, velvet by Ocado. Bookmark the permalink.